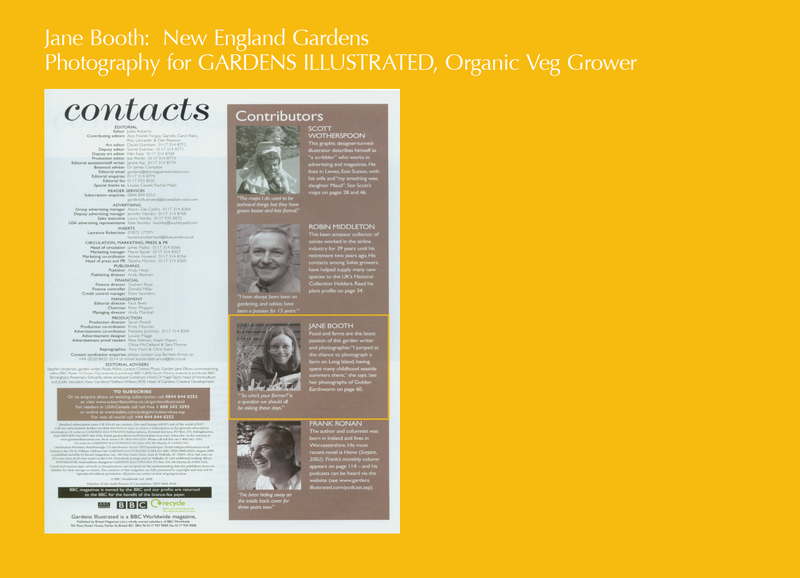 Rice is nice, especially when grown in Vermont’s cold climate! I was thoroughly captivated with every step of the process and was proud when I had a chance to step into the paddy and plant seedlings alongside Takeshi and Linda Akaogi. 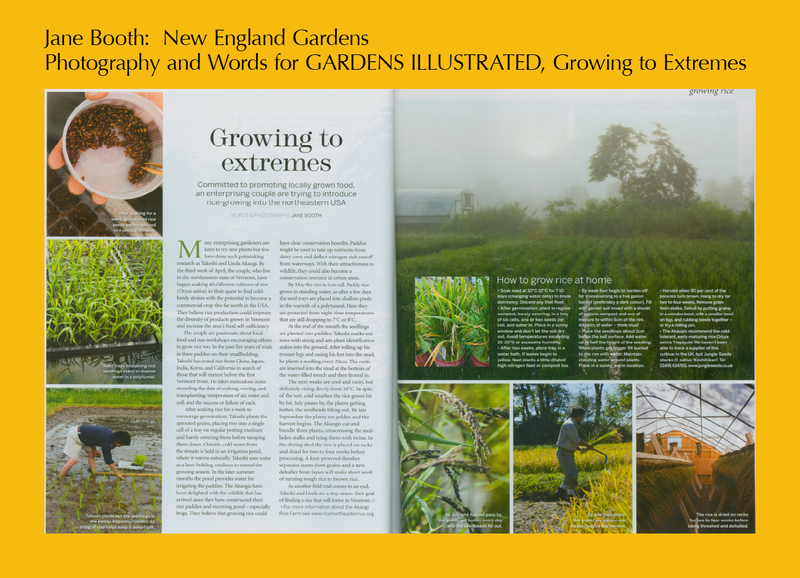 This entry was posted in Gardens Illustrated, Published Work and tagged garden photographer, garden writer, Gardens Illustrated, Growing rice in Vermont, harvesting rice, how to grow rice, Jane Booth, Jane Booth garden photographer, Jane Booth garden writer, Jane Booth photographer, Jane Booth story production, Jane Booth writer, Linda Akaogi, New England, New England gardens, private garden, procedure for growing rice, rice, rice trials, story production, Takeshi Akaogi, vegetable gardening, Vermont on January 28, 2013 by Jane Booth. 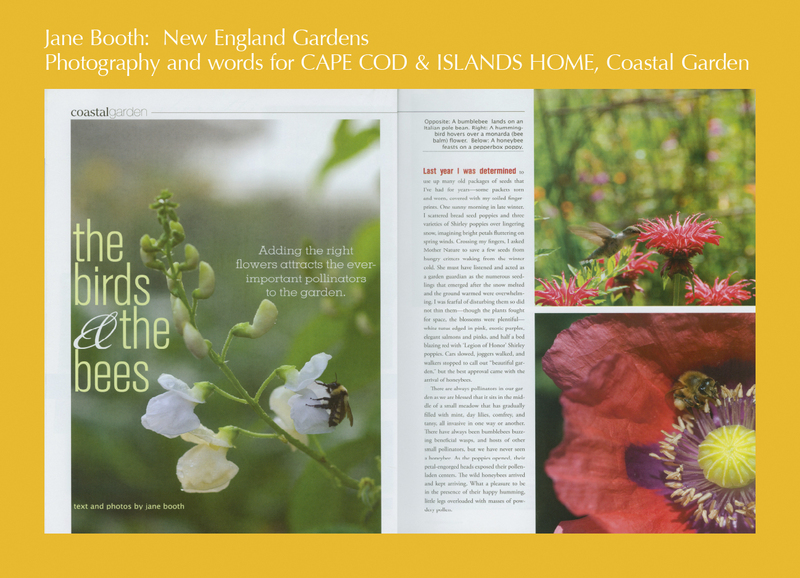 The wild honey bees arrived and kept arriving. 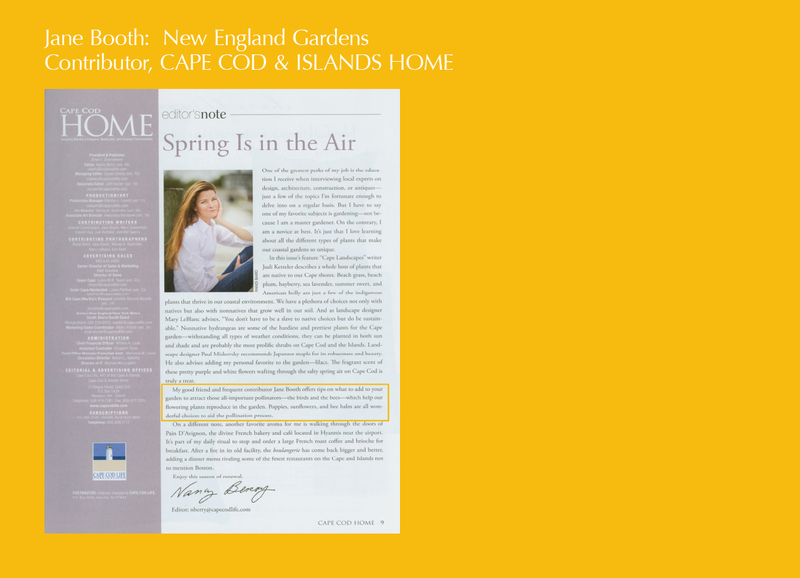 What a pleasure to be in the presence of their happy humming, little legs overloaded with masses of pale yellow pollen. 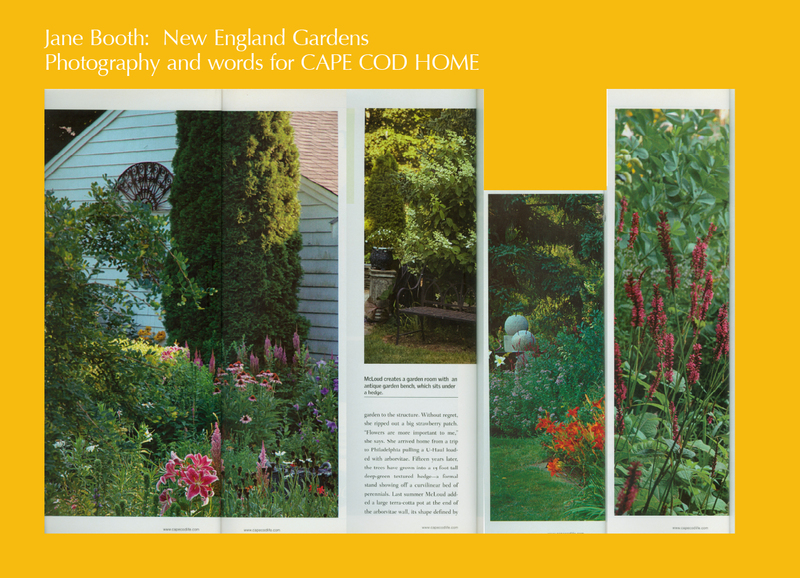 Sunflowers of all shape, size, and color sprout up in the arugula bed and in borders outside the confines of our fence. Some are planted by us but others are volunteers dropped by sunny goldfinches who come looking for treats as soon as the flower heads mature. 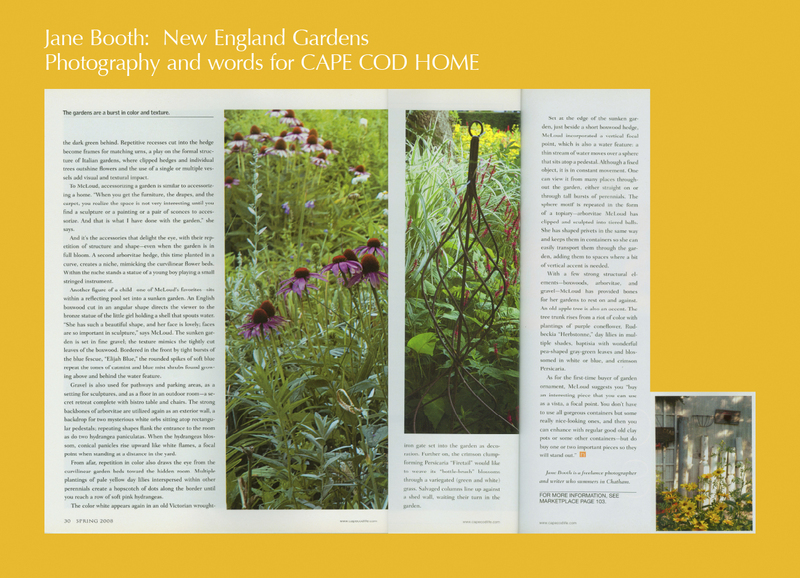 This entry was posted in Cape Cod Home, Published Work and tagged bee balm, birds and bees, bread seed poppies, Cape Cod, Cape Cod outdoor living, freelance photographer, garden photographer, garden pollinators, garden writer, Goldfinch, honeybees, hummingbird, Jane Booth, Jane Booth New England Gardens, Jane Booth photographer, Jane Booth story production, Jane Booth writer, Legion of Honor poppies, Mondarda, Shirley poppies, sparrows, sunflowers, vegetable gardening, Vermont, wrens on January 26, 2013 by Jane Booth. 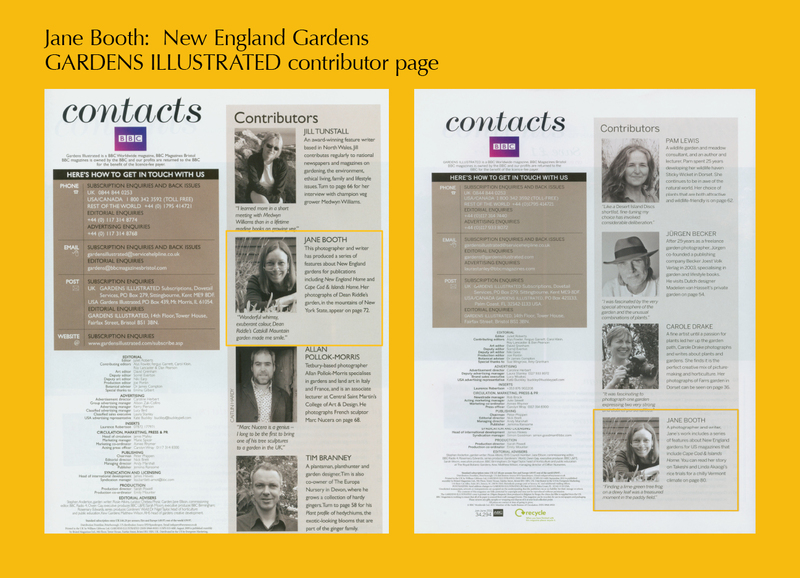 Here is my smiling face in my favorite gardening magazine of all time, Gardens Illustrated. 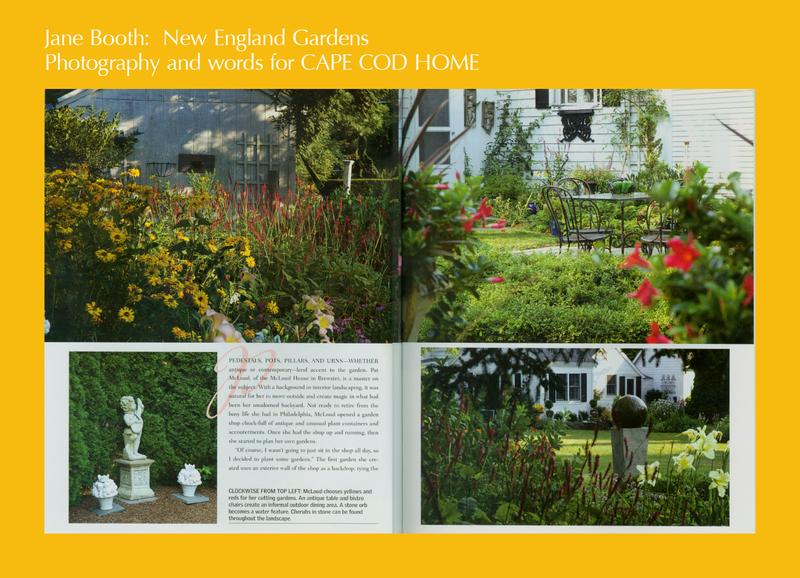 This entry was posted in Contributor pages, Gardens Illustrated, Published Work and tagged Gardens Illustrated, Jane Booth, Jane Booth garden photographer, Jane Booth garden writer, Jane Booth New England Gardens, Jane Booth photographer, Jane Booth story production, Jane Booth writer on January 25, 2013 by Jane Booth. 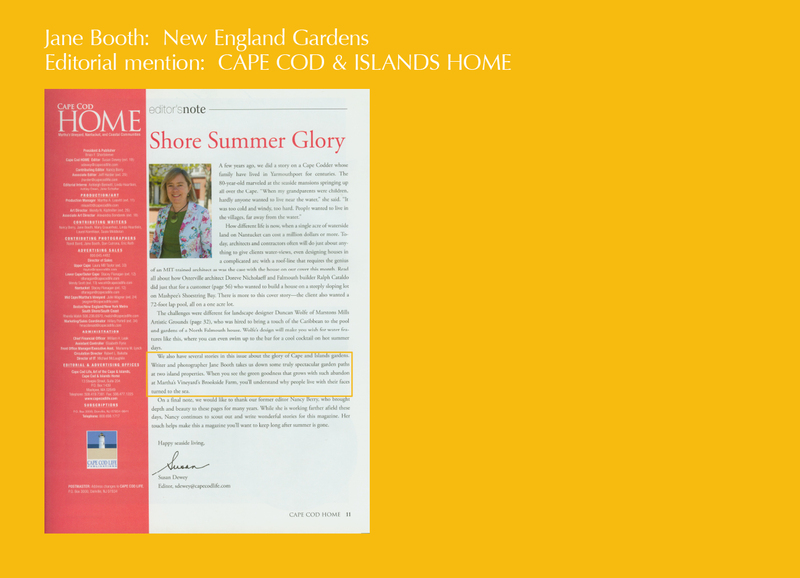 Susan Dewy, editor of Cape Cod Home, gives a nice mention to Jane Booth, garden writer and photographer. 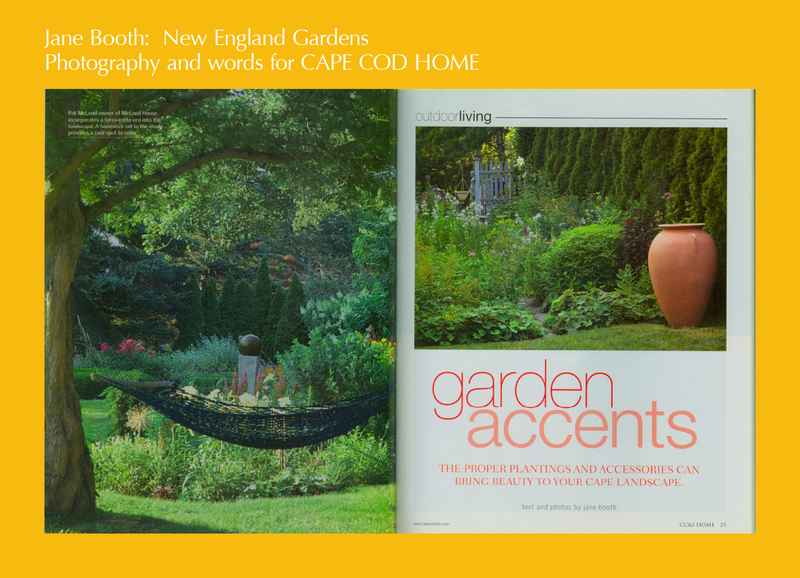 This entry was posted in Cape Cod Home, Contributor pages, Published Work and tagged garden photographer, garden writer, Jane Booth garden photographer, Jane Booth garden writer, Jane Booth New England Gardens, Jane Booth photographer, Jane Booth writer, Marthas Vineyard on January 25, 2013 by Jane Booth. 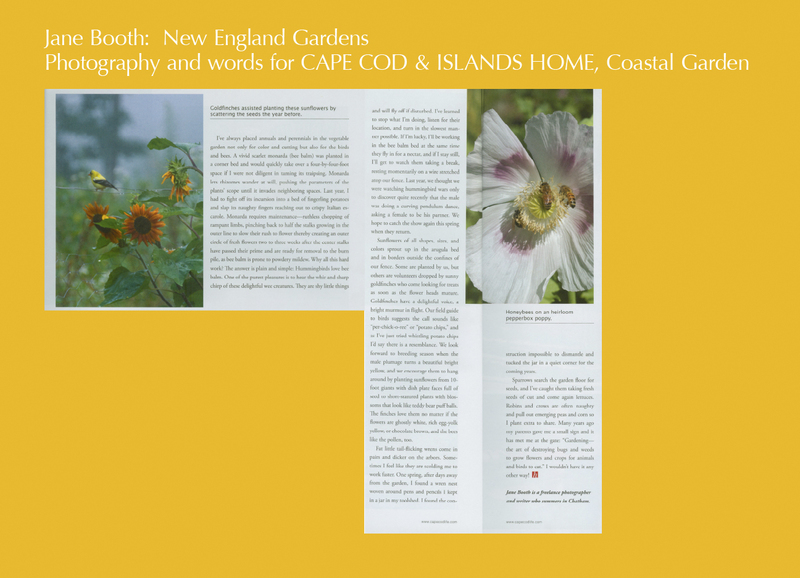 This entry was posted in Cape Cod Home, Contributor pages, Published Work and tagged Jane Booth, Jane Booth garden writer, Jane Booth New England Gardens, Jane Booth photographer, Jane Booth story production on January 24, 2013 by Jane Booth.